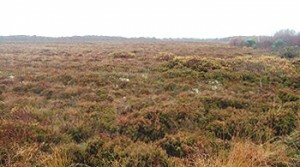 The Bog of Allen Nature Centre, in Lullymore, near Rathangan in Co. Kildare is an international centre for peatland education, conservation and research run by the Irish Peatland Conservation Council. 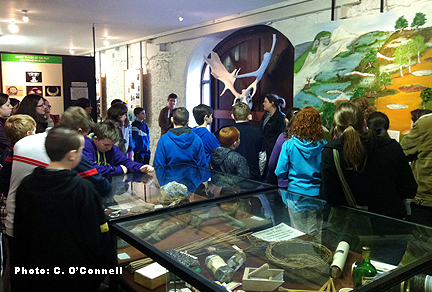 This guide and map provides more information about the nature centre. If you are planning to visit you might also enjoy our virtual tour and the practical information we have prepared to help you find us. The turf fire was the main source of heating and cooking in 19th century Ireland. 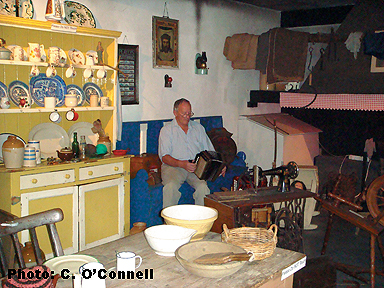 At the Bog of Allen Nature Centre you can explore the typical interior of a traditional Irish cottage. The furnishings were utilitarian and included a dresser to hold the delf and a settle bed placed next to the fire for extra warmth. there was no television, people entertained themselves with story telling, conversation and music. Bog butter, coins, the Great Irish Elk and an ancient dugout canoe are just some of the fascinating things that have been recovered in an excellent state of preservation from the Bog of Allen. You will see all of these at the Bog of Allen Nature Centre. What should the future for our boglands be? This exhibition will get you thinking and talking about bogs. It celebrates the beauty of Irish boglands and their unique wildlife. It describes the value of bogs in storing greenhouse gases and carbon, storing water, helping to control flooding, providing a refuge for plants and animals and providing spectacular places for recreation. It looks at the ways man has used the boglands of Ireland and tries to find a balance between the need to conserve a representative sample of the bogs and to use the rest of them wisely for future economic and agricultural developments. In the gardens at the Bog of Allen Nature Centre is a special feature called Flytraps. Flytraps is a greenhouse of insect eating plants which are found in bogs all over the world and is the largest collection in Ireland and Britain. Insect eating plants are probably the most amazing plants of boglands. You will see active insect trappers such as Sundews, Venus Fly Trap, Butterwort and Bladderwort. These are plants that move to catch insect prey. You will also see passive fly trappers such as the Cobra Lily and Pitcher Plants. These plants do not move to trap prey but they use a range of tactics to lure insects to them. Then they drug the insects with “narcotic-enhanced” nectar which helps to ensure the insect drowns in the watery liquid found in their cup or pitcher-like leaves. Stages in the formation of a raised bog are shown in the gardens at the Bog of Allen Nature Centre. See the reconstructed habitats of lake, fen and bog representing 10,000 years of history. 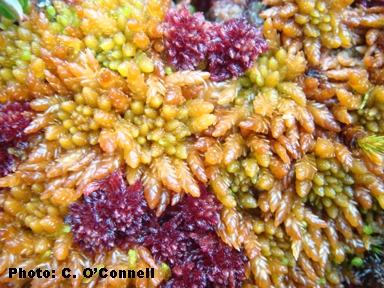 Dip for mini-beasts in the wetland habitats and see Sphagnum moss – the bog building plant that holds up to 20 times its own weight in water. The wildlife conservation gardens at the Bog of Allen Nature Centre are situated on a one acre site to the rear of the centre. 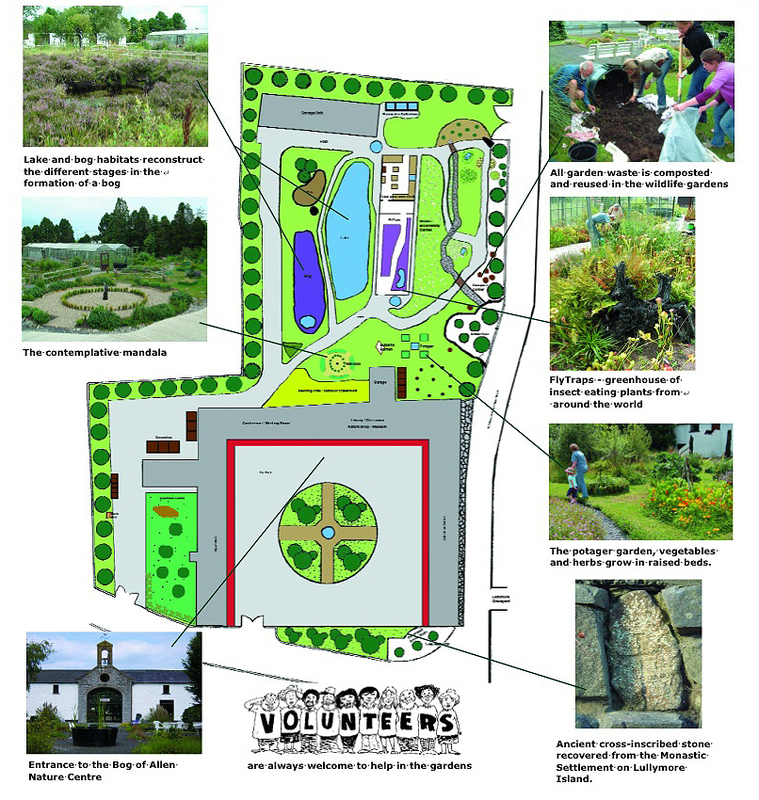 Work began on the gardens in 2004 with the aim of providing a refuge for biodiversity. The gardens are entirely peat free. Home-made compost is used to enrich the soil. The wild flower beds have been created to benefit insects. The Bog of Allen Nature Centre gardens are managed without using pesticides, chemicals, peat based soil improvers or tap water. We collect rain water to supply the water features and water the carnivorous plants. We compost all organic materials using compost cones, heaps and worm bins. We collect autumn leaves to make a seed compost. We control pests such as snails by encouraging a healthy population of frogs and beetles. And the wildlife love it. Be sure to collect IPCC’s top ten wildlife friendly gardening tips – ideas for you to try in your own garden. Finish your day in the bog by visiting Lodge Bog – a living bog nature reserve in the Bog of Allen. 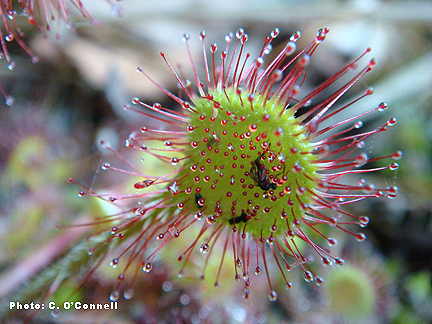 Here you can find live sundews, feel the watery bog move and listen for the Curlew calling. There is a boardwalk on the site and a seating area for you to take in all the sights and sounds. All year from Monday to Friday: 9am to 5pm (last visit 4pm). We are not open at Christmas or on public holidays.